ClearView Clio: World's first and only Transparent Speaker! ClearView Clio: World’s first and only Transparent Speaker! ClearView Audio has unveiled its Clio Bluetooth wireless speaker at CES 2014. 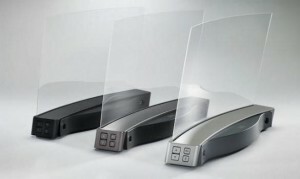 The speakers boast of a unique “invisible” design that consists of an ultra-thin, arched acrylic glass transducer. The Bluetooth speakers provide a cord and clutter free experience. The device has a Bluetooth front and center but on the back there is a line-in for any non Bluetooth devices. The speaker’s design allows for it to output sound in multiple directions and has mute, volume up/down, and Bluetooth buttons on its side. ClearView speakers use a moving cone and membrane to produce sound, and has a setup that includes thin panel of acrylic glass and actuators. The actuators cause the glass to vibrate, that produces sound waves. The glass is freestanding and radiates sound evenly around the speaker. ClearView Audio also supports its patented “Edge Motion” audio system in the speaker, that pushes sound from the side of the device. “ClearView Audio’s patented Edge Motion audio systems use a differentiating mechanical principal to generate sound. Instead of pushing from behind, like a traditional cone speaker does, Edge Motion-driven speakers actuate a thin membrane along the side in a manner that creates an extremely efficient, piston-like motion in front. The result is a speaker system which is thin and lightweight with the ability to produce a rich, full sound across the audio range.” the official website states. Clio is available for pre-order on the company’s web site, with an expected shipping date in May. The device is available in three colors (Silver, Charcoal, or Dark Bronze) and costs $349.00.